Griffin Ukuleles ----Hear The difference! The rich full tones of a quality, solid wood ukulele bear little resemblance to the sound produced by the inexpensive laminate instruments flooding the market from over-seas. If you are a serious player you owe it to yourself to own an instrument made by hand with loving care and the finest of tone-woods. Each year I build a limited number of ukuleles for discriminating players. You might enjoy reading the ever growing blog where you will find construction tips and where I will share with you my ongoing ukulele experiences. There will be special emphasis on what I continually learn in the ever challenging adventure of building hand made ukuleles. 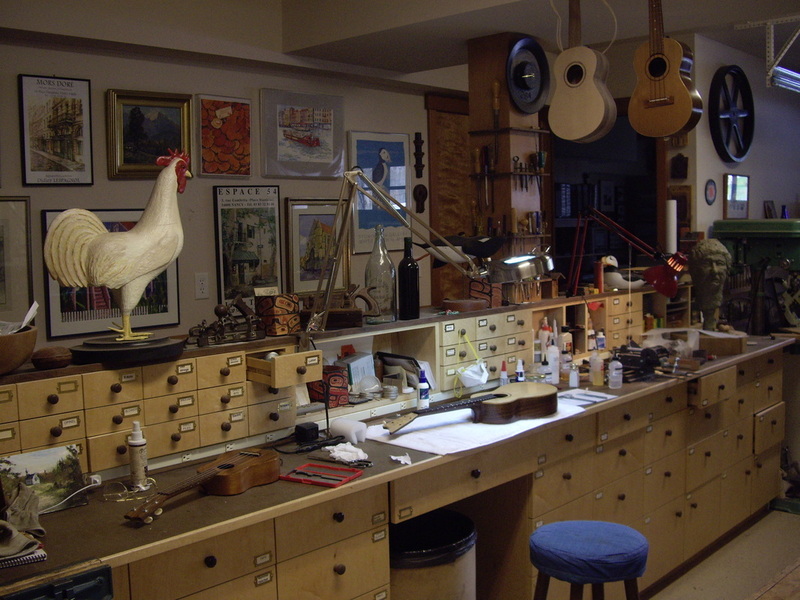 The workbench is an essential part of my basement workshop. You are welcome to visit, But be sure to call first.